Fill a pot with 1 quart (4 cups/1 liter) of water per serving of pasta you plan to make (1 serving = 1/4 pound or 100 grams), cover it, and set it to boil over high heat. When the water comes to a boil, remove the cover and add 1 tablespoon of coarse sea salt (a little less if it's fine-grained) per quart of water. In terms of saltiness, it should resemble sea water. When the water comes back to a rolling boil, add the pasta and give it a good stir with a wooden spoon to separate the pieces. - Fresh pasta, especially egg pasta (fettucine, tagliatelle, lasagna): 3 to 5 minutes. - Thin, dried durum wheat (eggless) pasta (spaghettini, shells, rotini): 6 to 9 minutes. - Dried spaghetti is generally 8 to 9 minutes, depending on the brand and thickness. - Thick dried durum wheat (eggless) pasta (penne, ziti, tortigioni, trofie): 12 to 15 minutes. Stir the pasta occasionally as it cooks, to keep the pieces from sticking to each other or to the pot. A minute before the estimated pasta cooking time is up, remove a piece of the pasta to check for doneness. You want an al dente, or chewy "to the tooth" texture -- not soft, limp pasta. Bite the pasta to check. If you see a thin white line or white dot(s) in the middle of the pasta, it's not done yet. Test again, and as soon as the broken piece is a uniform, translucent yellow, drain the pasta. Toss the pasta in your sauce and serve. DON'T ADD OIL to the cooking water, that just makes the pasta slippery so that the sauce won't stick to it. 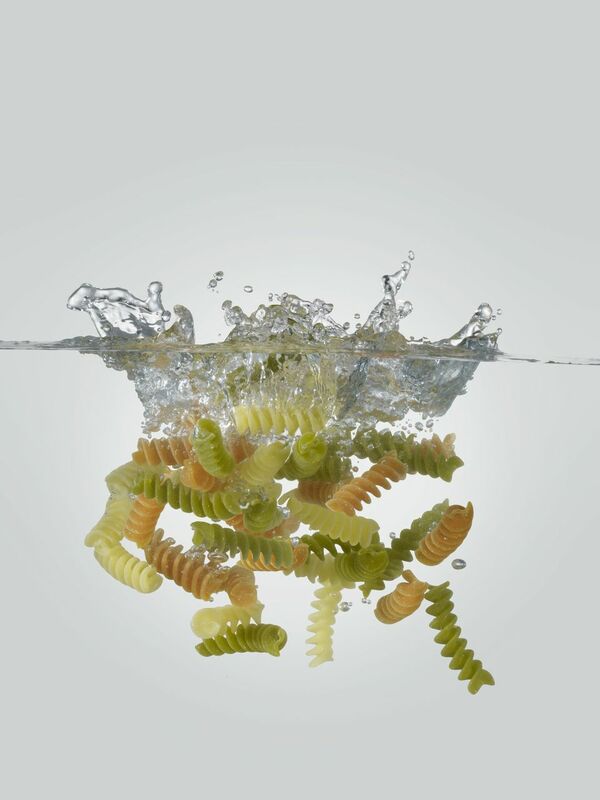 DON'T RINSE the pasta after draining, unless you plan to use it cold, in a pasta salad. Keep a little bit of the pasta cooking water in order to thin your sauce and help it adhere better to the pasta -- you might not always need it, but it's a good idea to always keep some. I usually place a small bowl underneath the colander in the sink as I drain the cooked pasta in order to automatically keep some of the cooking water. Finish cooking the pasta in the sauce: To help the sauce adhere better to the pasta, put the sauce in a broad skillet or saute pan and heat it while the pasta cooks.Drain the pasta 1-2 minutes early and stir it into the sauce in the skillet before the colander stops dripping completely. Toss the pasta and sauce over high heat for 1-2 minutes, until the pasta is done. This technique is called pasta strascicata, and will work especially well with creamy meat or vegetable sauces, for example, sugo alla bolognese, and marinara sauce. Do not use this technique with sauces that are uncooked, for example pesto, or oil-based, for example, aglio e olio.